That’s 780 months of marriage… Or 23,725 days!!! Wow-zers!!! And the thing is – they really love each other. Still… 65 years later. They Love. Nope. They chose humility, selflessness, teach-ability, willingness, trust, respect, hard work, dedication, commitment and they chose to grow… together. They met when they were 5 years old, my Grandpa would ride his horse thru wind, snow and rain to visit his one true love, they married at age 19 and now they drive a Lexus with a license plate that says “HAD2BU”. They began their journey as best friends… and still are. One of the foundations of a Marriage must be Friendship. Marriage as Mates. I am so grateful that P.A. is my B.F.F., my Bestie, my Mate! We kicked it off that way. We met working together at a Christian bookstore ~ Mardel. The first time I saw P.A. I laughed at him. I made fun of his outfit (because he was totally overdressed for his interview) and teased him about his cologne (because it was waaaayyyy too strong). He was cool with all of this. We loved laughing together, and could laugh at ourselves – *bonus*! We loved hanging out together and talking for hours, and on our lunch breaks, after work, on the phone, any chance we could get. And it hasn’t changed… much. Now we have to usually talk over the needs of the wee Babs, or save all of our conversation up until the evening time. But we talk. We go crazy if we haven’t talked enough. A friendship breeds on conversation. True, deep, authentic conversation. We love being mates who talk. And we laugh. Still we laugh at each other and at ourselves. We laugh thru the difficult times of pain, hurt, sorrows and screaming wee Babs. We laugh at life when it is hilarious and those times when it’s not so hilarious. We love being mates who laugh. P.A. and I are blessed to have (almost) 15 years of marriage under our belts. Our hobbies and interests (not Pinterests) are also similar. Since we met, we have truly enjoyed each others company. We have traveled throughout the US, Europe, and India. We dream of traveling more. We love dreaming together. We love being together. We both enjoy being outdoors, staying active, keeping fit, eating healthy, reading, drinking coffee, watching the same goofy PBS documentaries, cooking shows, and movies. And most of all, at the center of our friendship, is our friendship with Jesus. He’s the foundation of our friendship foundation. Here we are in 1996 – back in the diz-ay – when our friendship first began. Is everyday is a sunshine fairytale? Do we agree on everything? Do we laugh every second of the day? No. But sometimes we do think, this is too good to be true. Because it is. There is nothing better than being married to my mate. Even when it is difficult. There are so many people, places and things that can divide a marriage. I believe if a marriage begins with two mates, there is a stronger foundation at the core of that marriage. Like my Grandparents, my parents and P.A.’s parents, we have chosen humility, selflessness, teach-ability, willingness, trust, respect, hard work, dedication and commitment. We have chosen to grow… together. 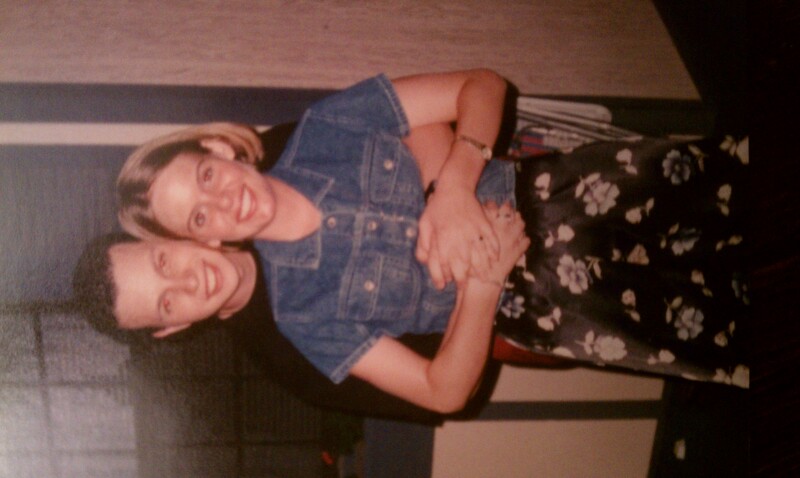 I am grateful that on in August of 2012 we will celebrate 15 years of marriage. And I am hopeful that in August of 2062, we will celebrate 65 years! I love being married to my mate. Are you Mates in your Marriage? I hope and pray so.